The Pear Avenue Theatre in Mountain View has developed quite a reputation for producing excellent classical theatre. 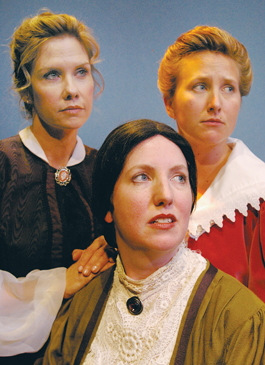 The current production of Chekov's "Three Sisters" is no exception. "....As a result, director Jeanie Forte was able to gather together one of the best casts in memory." "...Whether this is true or not -- whether the finished product is the result of canny casting choices or weeks of grueling work (or both) -- Forte deserves credit for putting together an accessible and quite moving production of this dramatic masterpiece." I checked with the theatre and apparently there are seats left for the last weekend of performances but they are going fast. There are still seats available for Friday night, September 28th and the Sunday matinee on September 30th. Thursday and Saturday are sold out. A.C.T. has finished casting for their upcoming production of "The Rainmaker". I'm very surprised that A.C.T. is doing this play. I guess I associate it mostly with community theatre and acting classes. But it is a classic story and if done well, should be very entertaining. I am happy to see that the wonderful René Augesen will be playing the lead role of Lizzie. Ms. Augesen is always a delight to watch. Casting Complete for Revival of Nash's The Rainmaker at San Francisco's A.C.T. Complete casting has been announced for the upcoming production of N. Richard Nash's The Rainmaker at San Francisco's American Conservatory Theatre. Mark Rucker (The Beard of Avon) directs the work, which is scheduled to begin previews Oct. 25 and open Oct. 30 at the Geary stage. The play's run will end Nov. 25. René Augesen will lead the cast (as Lizzie Curry) with Geordie Johnson (Bill Starbuck), Jack Willis (H.C. Curry), Alex Morf (Jim Curry), Stephen Barker Turner (Noah Curry), Anthony Fusco (File) and Rod Gnapp (Sheriff Thomas). The season continues at A.C.T. with David Mamet's Speed-the-Plow (Jan. 3-Feb. 4, 2008), Athol Fugard's The Blood Knot (Feb. 8-March 9, 2008), Nikolai Gogol's The Government Inspector (March 20-April 20, 2008), Sam Shepard's Curse of the Starving Class (April 25-May 25, 2008) and John Ford's 'Tis Pity She's a Whore (June 5-July 6, 2008). Tickets to The Rainmaker at A.C.T., 415 Geary Street in San Francisco, CA, are available by calling (415) 749-2228. For more information visit act-sf.org. I've heard from a friend that the current production of Sweeney Todd at American Conservatory Theatre in San Francisco is "freaking AWESOME". This is a new take on Sweeney in which the actors actually play the instruments on stage in addition to performing the show. Today I just read that the two young lovers of the show, will also be singing at the Plush Room. Lauren Molina and Benjamin Magnuson will offer a one-night-only performance at San Francisco's Plush Room Oct. 1. The cabaret event, scheduled on one of Sweeney's dark nights, will also feature other cast members from that Stephen Sondheim-Hugh Wheeler musical. Anyone out there see this Sweeney yet? I'm going on September 30th! Rest in Peace, Signore. You were wonderful and will live in our hearts forever.Thank you for touching us all with your genius. There are thousands and thousands of good performers in the world. There are hundreds of great performers and then there are those who transcend the abilities of all others. These rare artists are able to captivate an audience in ways that touch souls and transform lives in just an hour or two. Tony Bennett is one of these rare artists. Last night at Davies Symphony Hall in San Francisco, I was privileged to attend one of the most memorable musical performances I have yet to experience. The master vocalist Tony Bennett held an audience in the palm of his hand for ninety minutes of absolute bliss. This is the first time I have every been to a musical concert of this type where the audience with an average age of over 60 rose to their feet in five minute long standing ovations in the middle of the concert. After Tony sang the most amazing rendition of "For Once on My Life" the audience rose and clapped and cheered with complete adulation. It was one of the most beautiful renditions of any song I've ever heard. And, needless to say when he sang "I Left My Hear in San Francisco", at it's conclusion we all jumped to our feet with gratitude that Mr. Bennett, with that song, has made our wonderful city a place that the world adores. The most touching and profound moment of the show occur ed near the end of the concert when Tony told the sound man to turn off all the microphones. He and his guitarist stood center stage and as the guitar played Tony sang an unamplified version of "Fly Me to the Moon" that left half the audience in tears. What is it that he possesses that enables him to achieve such perfection in his art? Tony Bennett, born Anthony Dominick Benedetto on August 3rd, 1926 has had his share of sorrow and trouble in his life. A soldier on the front line in WWII he watched his friends die horrible deaths beside him. He suffered failed marriages, alcohol and drug addiction and a career that nearly ended many times. Ironically, these are the very experiences that make him the soaring performer that he has become. When Tony Bennett sings to you, he sings completely and utterly from his heart. He is a man that has survived the worst that life can dish out. He survived and transcended his troubles, and he has become what we all can only hope to become as artists: people who are able to let down the walls of doubt and fear, and open our hearts with love to people we don't even know. Isn't this, coupled with talent and skill, what touches us deeply when we go to the theater? For this is when life is looked at through a mirror and given to us just as it is, unadorned, mysterious, awesome and wonderful.